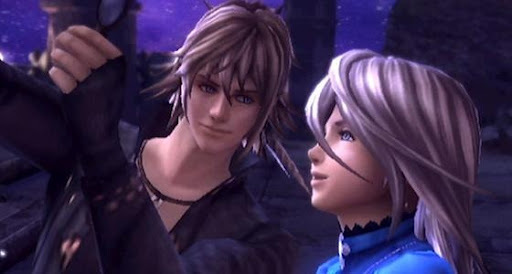 If you’ve followed the Operation Rainfall fan campaign for any length of time since its inception or have hung around this website for any length of time in the past couple of years, then chances are you’ve heard of a certain RPG for the Wii called The Last Story. 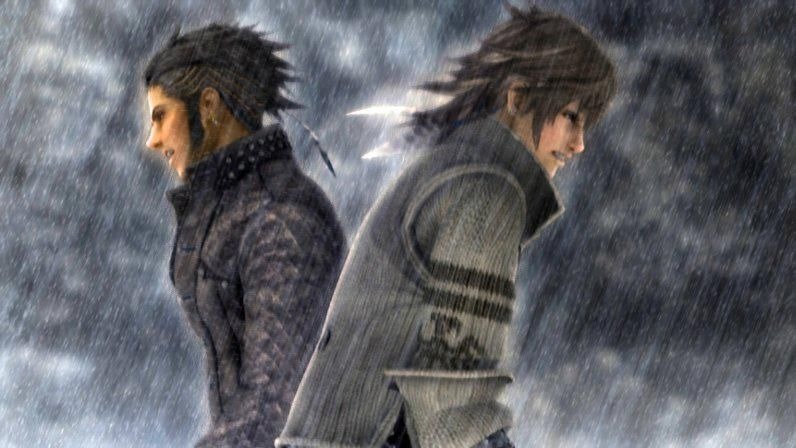 A remarkable game in a lot of ways, it marked the return of game designer and Final Fantasy creator Hironobu Sakaguchi to the director’s chair. 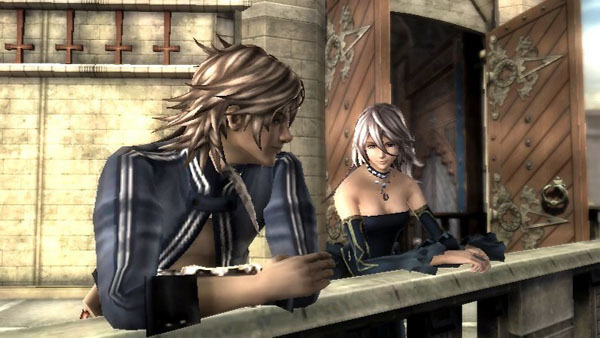 Fans of his Final Fantasy efforts will feel very at home with its plot and characters. And with that in mind, I’m here to talk to you today about the protagonist of The Last Story: Zael. 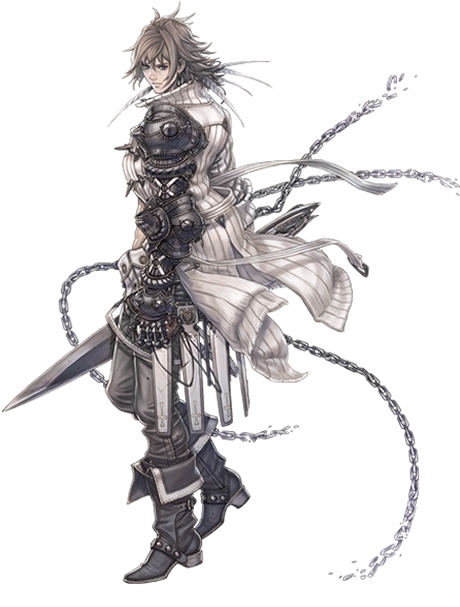 Zael, the central figure in The Last Story. WARNING: From this point on, there will be major spoilers for The Last Story. Zael, in a lot of ways, comes from the classic mold of Sakaguchi protagonists like Final Fantasy IV’s Cecil Harvey. It’s revealed early on that Zael’s primary motivation in life is to rise from the ranks of common mercenaries and become a knight; a desire he’s harbored since childhood, after being orphaned by bandits that destroyed his village and murdered his family. His only remaining possession from his childhood is a pair of lenses he can use as a telescope; a gift from his deceased father. Zael, showing his magnifying lenses to Calista while viewing a meteor shower. But while Zael’s origins are the stuff of callow fantasy youths everywhere, he didn’t immediately pick up a sword and start beating heads only to come face to face with some great evil the first time he rounded the corner. Together with Dagran, a fellow orphan that became his best friend, he set off on the tough life of a mercenary. The two founded their own company, sticking with it even as the other members of its roster came and went. By the time the game starts, Zael is already fairly accomplished as a mercenary. However, he’s not some grizzled veteran that’s seen and done it all, bitter toward the world and all it holds. Through his adventures, he’s kept his idealism and maintained his most cherished dream to one day become a knight. He has journeyed with his comrades to Lazulis Island in the hopes that dream might come true. 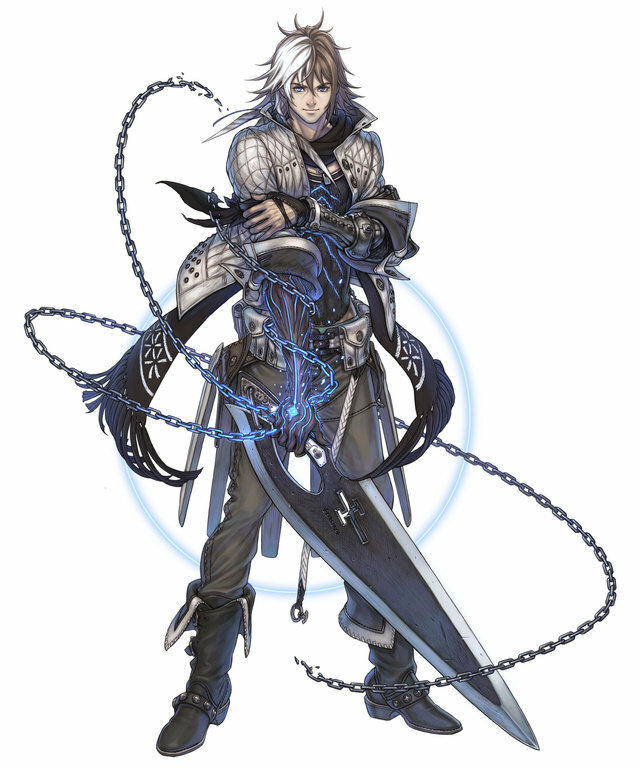 A magic chain appears around Zael when he uses his power to gather enemies toward him. However, things take quite a turn before Zael has even made it into the city for his first decent night’s rest at the inn. On the way to Lazulis City Zael and company find themselves in some ancient ruins, where a mysterious voice speaks to Zael in a time of need and bestows upon him a special power called the “Gathering”. It’s a power that Zael doesn’t know much about, but it proves to be a help in giving him and his friends a tactical advantage over the monsters they face. Despite this the power also never goes to Zael’s head. He’s aware that it’s a tool to help others and doesn’t come to depend on it as a crutch, nor does he lord it over others. Even without his power, he’s more than capable to hold his own. Zael is skilled with a sword as well as being the only party member practiced with a crossbow. He also slides well into the company’s leadership role after Dagran steps aside with a mild eye injury and gives him command. In some ways, the power he receives is just an extra blessing that provides an edge. As is often the case with such blessings, the power proves to have its own curse; an indirect one in this case. After a wild series of events that sees Zael become friendly with Calista, the niece of Lazulis Island’s Count Arganan, rescuing Calista from an invading Gurak fleet, stowing away with her on a ship from said fleet, having some more adventures, and then finally returning home, Zael’s welcoming party comes in the form of a criminal trial thanks to Jirall, Calista’s vengeful fiancé and a Class-A fop. Zael’s last-second rescue comes from the intervention of Count Arganan himself, who identifies Zael’s power as that of the mythical Outsider of ancient legend. Zael is subsequently freed, offered the rank of a knight-in-training, and is given a shot at marrying Calista himself. Becoming a knight and getting the girl of his dreams? It’s everything he could have possibly asked for, and so of course there’s a huge price tag attached. Zael effectively becomes a hostage to Arganan’s desires. The power of the Outsider is actually capable of moving all of Lazulis Island like a ship, and the count wants Zael to park it right next to the Gurak home continent so that a good old-fashioned military invasion can take place. And if Zael doesn’t like that, well, back to prison he can go. In cooperating with Arganan, Zael only makes Calista upset to the point she refuses to see him. So Zael is finally on the road to knighthood and Calista’s hand in marriage, but has none of the actual joy that should be associated with either of those things. His dreams have effectively been turned on their head. Zael is forced to do things he doesn’t like and witness things he finds horrible, as the invasion of the Gurak continent leads to knights he once idolized barbarically slaughtering defenseless civilians. He also gets thrown in jail a second time after Jirall accuses him of the assassination of General Asthar – the highest ranking and most noble person in the Lazulian forces. Zael is only able to escape this predicament thanks to Calista, who comes to her senses when she realizes that Zael isn’t a horrible person, and his cooperation with Arganan was only done out of coersion. After she breaks him out of prison and his name is cleared (with the blame for Asthar’s death falling squarely on Jirall), Zael is finally given the offer he had waited for his whole life. On the day that Zael and Calista are to marry, Arganan asks that Zael swear fealty to him as a knight. This time, however, Zael has the guts to say no, because Arganan is a crazy, warmongering jackass. To the delight of his friends, he hightails it with Calista in tow, ready to escape. But once again, a wrench is thrown in Zael’s plans, and he’s forced into fighting again when the Gurak attack Lazulis Island with a superweapon. Cue the climactic dungeon! All of the above is a pretty rough, extremely truncated take on a lot of what Zael goes through, but the main take away from it all is that no matter how bad things get, Zael remains true to himself in the end, even when he needs the occasional kick in the pants from his friends to give him the confidence he sometimes lacks. But like Sakaguchi protagonists in the vein of Cecil, one of his friends is less than truly friendly. Dagran, Zael’s childhood friend and mercenary partner, ultimately plays the role of Zael’s foil. Through his negotiations, it was he that had set everything up so that Zael might have a shot at his dreams. But Dagran also did it for a free ride on Zael’s coattails. Unlike Zael, who openly idolized the knights, Dagran had hated them since his own childhood, as they, not bandits, were responsible for the deaths of his own family. It was he that murdered Zael’s mentor Asthar, and he even conspires with the leader of the Gurak in order to destroy the knights. Zael owes everything he has to Dagran, but Dagran provided it all to use Zael as his vehicle for revenge. It’s a twist that I, at least, saw coming a mile away; Dagran is Kain to Zael’s Cecil. But even after beating him, Zael can’t truly hate him. Dagran may have lived with a quiet bitterness and committed treasonous acts, but all of the good things that Zael earns, as he properly wins Calista’s heart and succeeds in becoming a knight on his own merits, wouldn’t have been possible without Dagran, backstabbing or no. Far more than Dagran, it’s Calista that provides Zael’s greatest motivation throughout The Last Story. The girl of his dreams, Calista is very much Zael’s Rosa or Rinoa. It’s difficult to talk about one without the other because they complement each other so well. Set aside the warring, and Arganan’ and Dagran’s machinations, and the primary crux of what’s left is a love story. The vast majority of the adventures that Zael finds himself in and perseveres through are for the sake of Calista, whether he’s rescuing her, being rescued by her, fighting at her side, or atoning for actions that upset her. Without Calista, Zael would have lacked the impetus that set him off on his adventure, and the tale told in The Last Story would be a vastly different one. Zael’s story would be nothing without Calista. 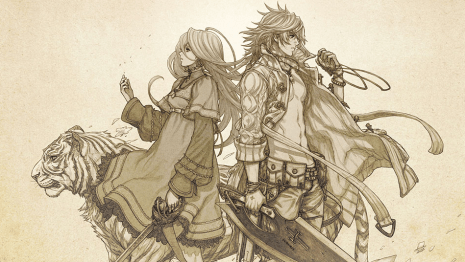 As the game’s lead Zael carries The Last Story on his shoulders. While it certainly has its flaws, he isn’t one of them. Zael is a kind-hearted dreamer; charming and capable, but also kind of a dork that thrives when he has the support of others. From humble beginnings he grows in resilience, and though he encounters numerous bumps along the way, he earns his just rewards in the end.